If you're mildly miserable, totally disgruntled, fearful, or just overwhelmed, you're in good company. Millions of people are asking themselves why they've bought into company dogma, their boss's crap, and the idea of working 5-7 days a week; on call virtually 24/7. Seriously wondering "how did this happen to me?" The answer is simple: you wanted success, and you bought into the American dream of being a hard-working, solid citizen. You thought you were doing the right thing choosing the field you did. Maybe it offered stability and security or glamour. Now what seemed like a smart strategy is getting old. Branding is the marketing equivalent of the 'killer app'. To quote business management guru Tom Peters: "Brands are everything." But what is a brand? "Brand" is derived from the English "torch", a trademark or mark identifying a product or manufacturer. In practice, branding involves the communication of a set of expectations, or a selling proposition. Kellogg on Branding author and marketing professor Tim Calkins notes that the fundamental aspect of a brand is the set of associations linked to it. In the marketplace, your brand is your reputation. Have you heard the news? A diet low in fats, contrary to what you've always heard, won't save women from heart disease, or from breast cancer or colon cancer either. That's according to an 8-year, $415 million US-government funded study. Are you confused? Does that mean you can eat fats without fear? Not so fast. If you're tempted to take these results to heart, don't. This study had a number of critical flaws, meaning that it would be a mistake to generalize it to the total population of women. Only the Good Die Young in Exhibit Honoring Killed Advertising. Award-winning copywriter Leslie Goodbar had two technology campaigns exhibited in a New York gallery as part of "The Night of the Living Dead," a showcase recognizing creative advertising killed before seeing the light of day. The One Club, which also puts on one of advertising's most respected award competitions, sponsored the show to honor and promote creativity in an industry where some of the best work, due to financial reasons or otherwise, often meets an untimely demise. Leslie's print campaign entitled "Moments" was created with art director Pia Abbott for Mitsubishi Presentation Products to promote a new digital software for photo labs. The ads successfully developed a creative twist on the idea of ease-of-use, but launching the actual product apparently proved a bit more difficult, so the ads never went to print. The TV spot, created while at Ayzenberg Group for Allpets.com, brought to life the idea that pets are people too. Although never broadcast, the concept apparently may have more longevity in the end than the website, which unfortunately did not survive the dot-com bust. Both campaigns from the exhibit can be viewed at http://www.zippercreative.com/itsalive.html. 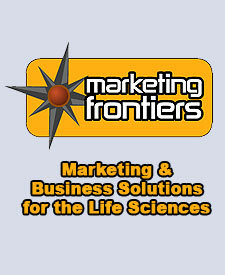 Featured Business: Marketing Frontiers, Inc.
Marketing Frontiers is a San Diego-based firm that specializes in marketing and business development services for the life sciences industry. Our clients include manufacturers of products and contract service providers. Our approach focuses on you and your customers with the goal of creating effective strategies to enable and support your business. For more information, please visit www.marketingfrontiers.com, or call (858) 433-1512. ETech, the O'Reilly Emerging Technology Conference, frames the ideas, projects, and technologies from innovators and lead users into a coherent picture to learn from and build on. ETech 2006 brings a thousand creative spirits and open minds together to dig into the idea of the "Attention Economy": How can we filter, access, visualize, and remix the immense amount of digital data now flooding our lives? The coming technical challenge is not about generating content, but doing something meaningful with it. ETech happens March 6-9, 2006 at the Manchester Grand Hyatt in San Diego, California. WITI Members: A 10% discount is available. Visit the Member's Area for the promo code. For more information, http://conferences.oreillynet.com/etech/. See you at the Conference! What is a blog? Discover how blogs differ from a regular Web sites, and the key advantages they offer. Why blogs are getting so much attention? See why something that started as a system for creating online diaries has evolved into a powerful platform for business. How to take advantage of blogs? Get all the "how to" instruction you need to start blogging now. WITI Members: A $50 discount is available. Visit the Member's Area for the promo code. For more information, http://blogbusinesssummit.com/seminars/. See you at the Summit! The nomination deadline for the prestigious 3rd annual Key Women in Energy-Americas awards is March 1, 2006. The awards annually identify, recognize and honor up to 100 women for individual excellence in their work in, or support work for/with, the energy sector. Seven (7) categories include Leadership, Pathfinders/Trailblazers, Visionary, Wisdom, Innovation/Creativity, Teamwork (new) and Potential. The Pathfinders/Trailblazers award is also given for lifetime achievement. The Potential award, to encourage future leadership, is only for new-hires to the energy area since 1 January 2002. The award recongizes excellence across the entire energy value chain (oil, gas, power, nuclear, hydro, hydrogen, wind, nanotechnology, generation, transmission, E&P, research & development, academics, government, associations, etc.). Judges are respected energy executives and often past honorees. Self-nomination is permitted. Nominations and previous honorees are available online at www.keywomeninenergy.com. A PDF format nomination is available online (http://www.keywomeninenergy.com/images/pdfs/nominationform2.pdf). Nominations may be electronically submitted at http://www.keywomeninenergy.com/index.php?option=com_mosforms&Itemid=100. For more information, http://www.keywomeninenergy.com. See you at the Awards! Thank you to everyone who nominated women for the 2006 Hall of Fame inductions. The nomination information for 2007 will be available this summer. Open to a great opportunity? This position reports to the Development Engineering Manager, and requires a minimum of five years software design experience. A bachelor's degree in Computer Science, Computer, Engineering, or Electrical Engineering is required; a Master's Degree in Engineering is preferred. Expertise of the Windows CE operating system and experience implementing Windows CE applications is necessary. Strong communication skills to work directly with customers and support application SW developers. This position reports to the Development Engineering Manager, and requires a minimum of five years software design experience. A bachelor's degree in Computer Science, Computer, Engineering, or Electrical Engineering is required; a Master's Degree in Engineering is preferred. Architect and implement IP security mechanisms for a consumer networking device. Must be able to evaluate existing and planned designs for IP security weaknesses, and develop solutions to resolve those weaknesses. Westell Technologies is currently seeking top-flight individuals! For more information about these positions, please contact Sheryl Shepherd at [email protected]. "STAND OUT! : Effectively Marketing Yourself"